For this assignment you will write a short essay in the mode of Roland Barthes’ Mythologies. In the preface to the collection, he notes that his essays were inspired by current events in the two-year period of 1954-1956 and his examples drawn from heterogeneous media (“a newspaper article, a photograph in a weekly, a film, a show, an exhibition”). 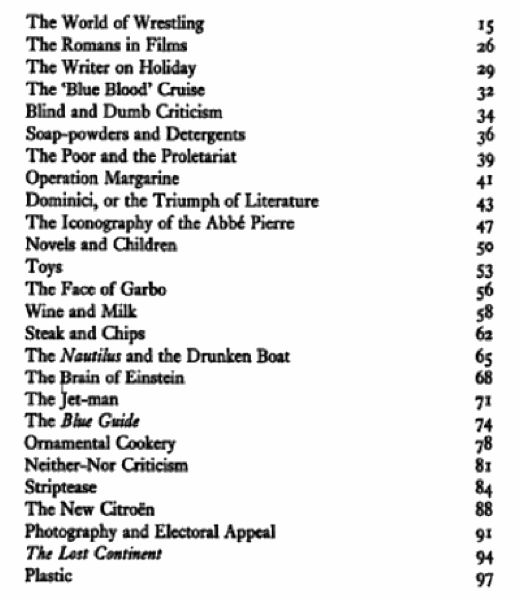 I have reproduced the table of contents below so you can get a sense of the range of his material. You should similarly feel free to write about any social phenomena or document that interests you; it need not be “literature.” Indeed one of the arguments Barthes makes is that “mythologies”—by which he means a social reality that is taken to be natural or “what-goes-without-saying”—is equally deserving, if not more so, of semiotic analysis because of the potential for “ideological abuse” that is hidden in plain sight. –> All quotations drawn from Roland Barthes, Mythologies, trans. Annette Lavers (New York: Farrar, Straus & Giroux, 1972). –> Apart from study of your chosen myth, you will not do any external research for this assignment. It asks for your analysis only.